Biggest question is since IJ is gone who is going to race the student? Did they not have spring games in WV? They did have a spring game in 2017. Last year, the spring game was snowed out. Oklahoma has played against Dana’s offense and defense 7 straight years. They know his game plan and I doubt they would devote any time to a Spring scrimmage recorded on a cell phone. This more than likely has to do with us being two deep on offense and not even having enough defensive backs worthy of a scrimmage to fill one squad, little alone two. Bingo. Guessing CDH doesn’t really know what his depth chart will be and doesn’t really want to put folks out there in certain positions that they may not belong in. Saw he said in another article that he won’t release a depth chart to the team until after the spring. I’m guessing we’ll have spring games after this year, but blame this year on CMA and the transition more than CDH. Do you see any newcomers that aren’t on the team this spring but will be eligible the upcoming season that can provide immediate help? I know our offense will be up for the task against OU but I’d hate to see us start a new season with a new staff with a 63-49 result like the Texas Tech game last year. It would definitely have an impact on the attendance for the Prairie View game. It would definitely have an impact on the attendance for the Prairie View game. I don’t know. If that PVA&M game ends up being at 11AM, we could beat OU by 40 and the stadium would still only be half full the next week. See, you are still being optimistic. You said half full instead of half empty. We we lose to OK by 14, that would be a win. I have yet to see a moral victory increase attendance. Honestly I am not worried about our defense, because we know going in it will be bad. But we also know we have better coaches in place for the future has no where to go but up. I guess that would be the one thing of info I’d like to hear about from Friday night. Knowing now that Clayton isn’t close to being ready for prime time, I’d like to know if Bryson is spending more time practicing as a drop back QB or a utility athlete. Yeah, I got a lot of push back when I wanted Tune to sit out the bowl game. Best case scenario he did great and saved Applewhite’s job? Worse case scenario, King (who hasn’t been healthy a full season yet) goes down in the first 5 games and Tune struggles as he loses another year of eligibility playing half a season again. The email that came in today says the - “game” / “scrimmage” / whatever - will occur at 7 PM, and there will be free parking in lots 12A and 12B - no other information of any kind. For example: Will there be a game, or just a scrimmage? Will people be sitting in the club? In the regular seats only on that side of the stadium? Should people enter in the center or the corners of the stadium? Little things like that? This whole thing has been handled in the most unprofessional way possible. But, what the heck should anyone expect from UH? They have been doing this kind of nonsense for years! And, they wonder why they can’t sell out the stadium!
" HOUSTON – The Houston Football program will open its doors to Houston fans on April 12 as Friday Night Lights takes place at TDECU Stadium at 7 p.m.
ICON Gate 2 and Gate 3 will open for the free event at 6 p.m. Free parking will be available in Lots 12A and 12B on the south side of TDECU Stadium. Only lower bowl seating will be available, seating will be first-come, first serve and concessions will be open. The Houston Team Shop will be open on the concourse with a special clearance sale set for the event." The Houston Football program will open its doors to Houston fans on April 12 as Friday Night Lights takes place at TDECU Stadium at 7 p.m. According to Dana … it’s going to be a practice, if you don’t want to see a practice, don’t come. 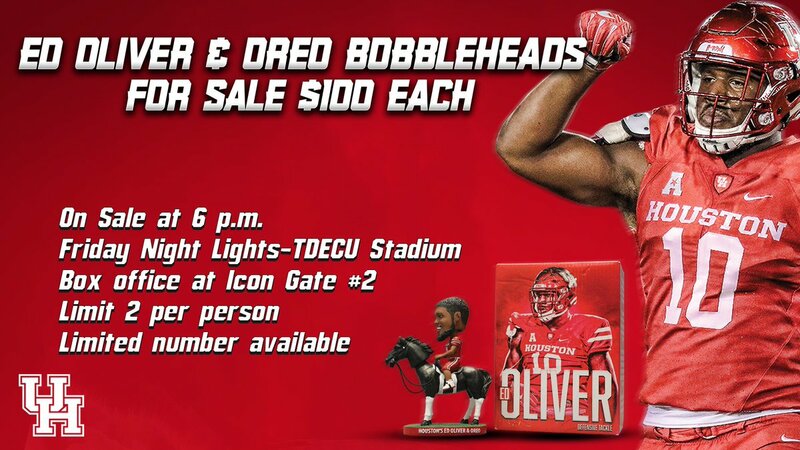 $100 for an Ed Oliver toy? They are probably basing he price on a couple of them being sold for over $300 on EBay. All I know, is Big Ed better be getting a big cut of it. Yeah, I got a lot of push back when I wanted Tune to sit out the bowl game. Best case scenario he did great and saved Applewhite’s job? I was right there with you. Terrible decision and if Smith wasn’t ready that’s on the coaches as well.